87. Definitely more than 50, but not as crazy as, say, 130. I wish it were a nice, even number if it were going to be that large, but most things in my life don’t fit into nice, neat, even-numbered packages. Maybe I should be glad it was only 87. 87: the number of times during this last week, since Sunday at least, that I’ve doubted my calling as a mother. That’s roughly 17 times a day, give or take a few, and the week isn’t even over yet. (Now, granted, we just returned from visiting family over the holidays, and I always feel a little blue after saying goodbye to the people I love that live roughly 1000 miles from me. But I digress.) 87 is the number of times I’ve thought that someone else could do this better than me; that, perhaps, I should stop kidding myself and try to look for a “real” job; that the time I invest in teaching my children to be responsive instead of reactive doesn’t really matter and who the freak really cares if my girls EVER learn to speak kindly with anyone. 87 represents the moments I’ve caved into the mommy guilt while cooking supper with a can mushroom soup AGAIN, while my well-meaning friends post recipes and pictures of their healthy suppers that include words like “organic” and “kale” and “quinoa” (keen-what?). 87 bears the tears and pain I felt when I burnt freaking pork chops in a CROCK POT. Who burns food in a Crock Pot?! Aren’t they supposed to be somewhat idiot-proof? I mean, the instructions for practically every single Crock Pot meal are: ‘Dump crap in. Push button. Serve in 8 hours.’ Seriously. AND in addition to that, I kind of forgot to make anything to go with them…. so we had burnt pork chops and, umm, raw baby carrots as a meal. Yep. Totally rocking this Mom thing. 87 tells of the many, numerous times I’ve had to hold my tongue and not be Snarky Steph when reading yet another sweet, mothering quote informing that I am going to miss these beautiful, sweet moments when I haven’t washed my hair in a week and my girls are fighting over who breathed the most air and my son is throwing a tantrum because my husband went to the bathroom for a minute and he simply cannot stand to be in the same room with anyone who is not his father for more than, say, 30 seconds. Yes. I’m going to miss that. 87 also reveals, quietly, sneakily, the number of times I’ve had to deal with my own childhood while watching my children live out theirs. And guess what? I don’t get to choose when I have those weird, God-ordained “Let’s let go of this piece of my past” moments. I’ve had to look in the mirror and confront fear, insecurity, and worry over who I was, what I went through, and now, who I’m helping shape my own children to be. I’ve had to let things go, speak Life over myself – not New Age positive pop talk, but authentic Biblical truth— and then step out in faith, and freaking dang it if that isn’t hard to do sometimes. Especially the week after vacation. Somebody get me a Cherry coke. 87 times, at least, He’s simply held me. He’s let me cry under the pressure of not feeling like I’m doing enough as a stay-at-home-mom, and not feeling cool or relevant enough as a homeschooling mom. He’s wiped my tears and smiled big Daddy grins because I’m His beloved daughter. He’s whispered in my ear, “You got this. I love you.” He’s given me strength to kick those lies in the face when they came around on the 88th time. So here we go, ladies. I’m yet again taking a deep breath and confidently pulling out my can of Cream of Mushroom soup. I’m brushing myself off and mothering boldly, fearlessly, laughingly. I’m also going to buy a Crock Pot cookbook, but that’s another matter entirely. 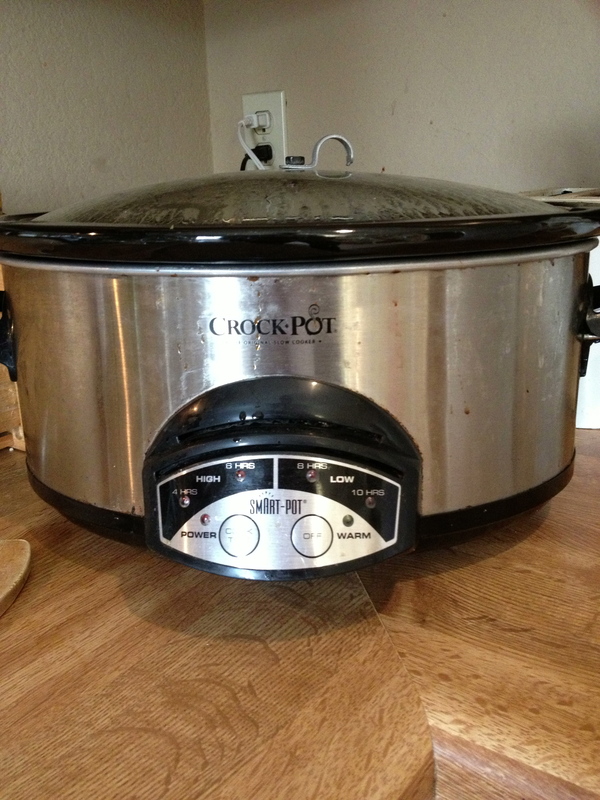 | Tagged 87, crockpot, devotional, i hate cooking, kids, moms, parenting, peace, quin-what? You are very real and that’s refreshing. I went to a Mommy bloggers conference a few months ago and it was good but I left very irritated and the only thing I could put my finger on was that there was a few “mommy bloggers” there that when they walked and talked and everything else, it was like they bounced. Bouncy, bouncy, you know? Probably shouldn’t be saying this in public cyberspace. But when I left that afternoon I was so irritated, and what really irritated me was that they were so far from anything that I ever was as a mommy and wondered if their bounciness was really real or if it was a show. Sorry, I guess I just vented. Bless you! Keep being real! Thanks for the realness! Girl, I so feel you on this one! Coming home from a 3 week vacation home with a HUGE tote full of new toys (not sure what happened to my simple Christmas request :/).and 4 kids hopped up from spending said 3 weeks at Grandma’s and a hubby who is totally swamped at work (yeah those 3 weeks again!) and about done! I’m in full blown survival mode over here, lol! Thanks for letting me know I’m not alone! love it…if you need a crock pot cook book…come to my house…I think I have like 5-6..one of which I am published in(long story) and yes…I have discovered that most of the are useless for the most part. No worries Steph. The moms that have to work have the same sentiments. The grass is always greener. And it’s technology that makes all those pinterest moms look faboo, Instagram your burnt porkchops and suddenly you’ll have a gourmet meal! This is not to downplay your feelings or belittle other awesome SAHMs, but if your heart and action is in the right place your children will thrive. OH MY!!! This hit the spot!! So funny! I laughed and cried! I needed this encouragement and I know this is blessing so many mamas!!!!!!! !